Properties in Gautier average 4.5 out of 5 stars. Great Golf Course Property Rental in the lovely city of Ocean Springs MS.
Property 8: Great Golf Course Property Rental in the lovely city of Ocean Springs MS. Waterfront House, Located Downtown, Minutes From The Beach. Property 10: Waterfront House, Located Downtown, Minutes From The Beach. Walk to the Beach and Downtown Restaurants, Bars, and Shops! Property 11: Walk to the Beach and Downtown Restaurants, Bars, and Shops! Gulf Front with great views and pool! Property 12: Gulf Front with great views and pool! Property 14: Amazing house! Perfect location! PRIVATE PIER Custom beach front home with awesome views of Horn Island. Property 18: PRIVATE PIER Custom beach front home with awesome views of Horn Island. St. Martin Home w/Backyard Near Beaches & Casinos! Property 20: St. Martin Home w/Backyard Near Beaches & Casinos! Ocean Springs 'Magnolia Beach House' on Pvt Beach! Property 22: Ocean Springs 'Magnolia Beach House' on Pvt Beach! Property 25: VACATION DREAM HOME! The Best Kept Secret In South Mississippi. Property 26: The Best Kept Secret In South Mississippi. Waterfront Ocean Springs House w/Beach Views! Property 28: Waterfront Ocean Springs House w/Beach Views! Gorgeous Ocean Springs Waterfront Home w/ Dock! Property 29: Gorgeous Ocean Springs Waterfront Home w/ Dock! You can see and do all things By The Sh'Ohr! Property 33: You can see and do all things By The Sh'Ohr! Luxury accommodations, jacuzzi, outdoor fireplace, in-ground pool, pets loved! Property 36: Luxury accommodations, jacuzzi, outdoor fireplace, in-ground pool, pets loved! Amazing Beach Front House only 50 Steps from the beach. Property 37: Amazing Beach Front House only 50 Steps from the beach. Surfside I - 5 Bedrooms - 4 1/2 Baths - Private Beach! Property 39: Surfside I - 5 Bedrooms - 4 1/2 Baths - Private Beach! PCS, Vacation, Rest or Relaxation, large enough for multiple families! Property 40: PCS, Vacation, Rest or Relaxation, large enough for multiple families! 100 yr old house Downtown OS. Short Walk to beach, food, art and entertainment. Property 44: 100 yr old house Downtown OS. Short Walk to beach, food, art and entertainment. 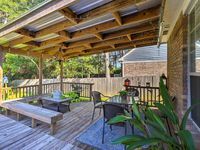 Ocean Springs Home w/Pool - 10 Mins to Beach! Property 45: Ocean Springs Home w/Pool - 10 Mins to Beach! Bottlebrush on Bowen - the perfect location in Ocean Springs. Walk to downtown! Property 46: Bottlebrush on Bowen - the perfect location in Ocean Springs. Walk to downtown! Property 48: New Beach Front Home! Luxurious Waterfront home close to everything! Property 50: Luxurious Waterfront home close to everything! This is a lovely home, in a nice quiet neighborhood. We were impressed with entire experience from the beginning to the end. The owner/manager was friendly, prompt and attentive. The home has a nice layout, perfect for a large family, with enough space for 7 of us to spread out and feel comfortable. The pool was spotless and the back deck was a great place to enjoy the warm spring days. The home is well stocked with anything you could need. Plenty of extra blankets, pillows and towels. We cooked in the kitchen all three days and had everything we needed. The beds were very comfortable and the house in general was spotless. We loved our time at this home and hope to come back again soon. Pelican's Perch is a beautiful home that is decorated wonderfully to create the feel of a retreat. The home is right on the Gulf of Mexico and has a small beach that is great for laying out, playing in the sand, enjoying an evening bonfire in the fire-pit, or just exploring for crabs and other wildlife. The highlight of Pelican's Perch in our opinion was the outdoor porches and deck. These spaces created wonderful spots to lay out during the day and relax in the evenings. We started every day on the deck with our coffee and ended every evening on the deck with a glass of wine, and it was a perfect spot to watch the dolphins play and the pelicans and other seabirds fish. A few other things that we used and enjoyed - A wonderful gas grill, a bucket of sand toys for the kids, some plastic beach type chairs for around the fire pit, and the pier next door. The owner was wonderful to work with and responsive with any questions that we had. I would recommend this house if you are looking to RELAX. Downtown Ocean Springs is super cute too, and we made a day trip to New Orleans which is 90 minutes away. We will certainly be back!